I think I might have a cinnamon problem. Silly, I know. Is there such a thing as Cinnamon Anonymous? I hope not because then I'd have to make a visit. It's easily my favorite spice, simple as it may be. From my very first taste of a sweet cinnamon roll, I knew we would be good friends. It's found in all of my favorite autumn recipes and the best apple pies. 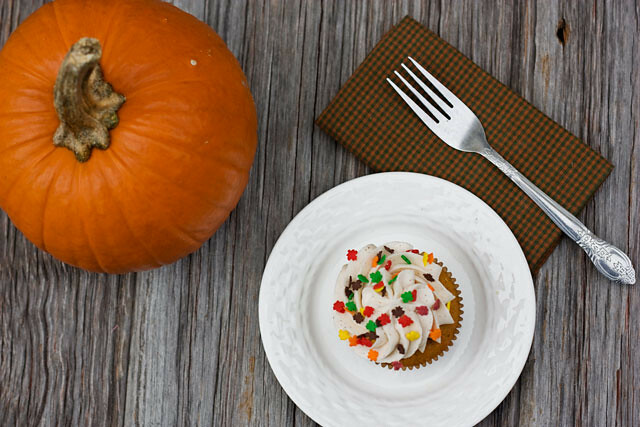 It was only right to include it in both the cupcake AND the frosting of these pumpkin cupcakes. I once had a professor tell me that she hated the smell of cinnamon. The culprit? Those cinnamon brooms that used to be hung for decoration. Do you remember those? I'm not sure why it came in broom form. It's much more appealing in breakfast form. 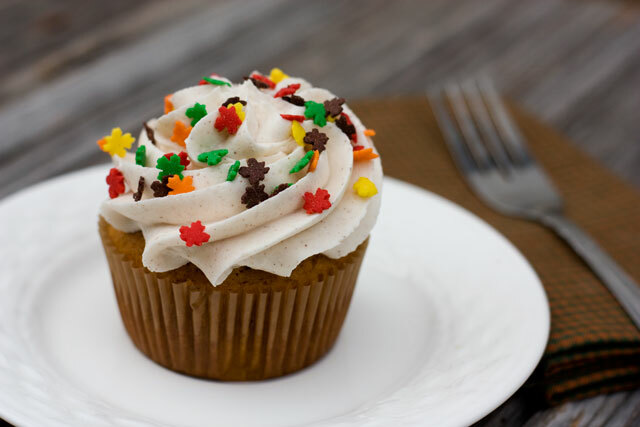 If I could, I would try to change her mind with these pumpkin cupcakes and all of their cinnamon-y goodness. Inside is a creamy, cheesecake filling that was inspired by the cheesecake filling in those infamous muffins found at my favorite coffee chain. 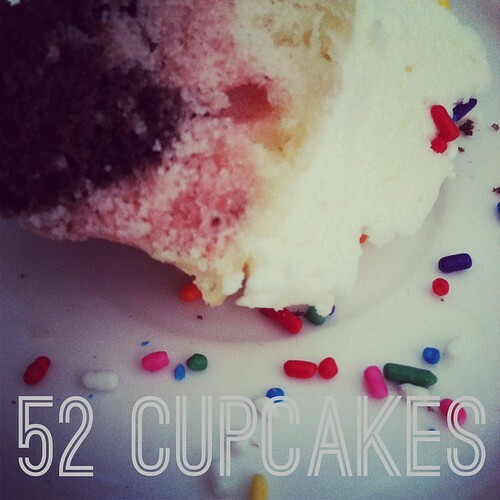 The sprinkles, of course, are optional and only intended if you want to achieve a happy-dapper-cupcake-muncher status. I've already made this recipe twice in the last week. Chances are good that they will likely reappear again and again throughout the season. Preheat oven to 350*F. Prepare muffin tin with cupcake liners. In a medium bowl, whisk together the flour, baking powder, baking soda, cinnamon, nutmeg, cloves, and salt. Set aside. In the bowl of a mixer, mix together the pumpkin puree, brown sugar, granulated sugar, and oil. Mix the eggs in one at a time, mixing well after each addition. Add the dry mixture into the wet mixture, one cup at a time, and stir until just combined. Fill cupcake liners 2/3 full with the batter. Bake for 24-30 minutes or until a toothpick inserted into the middle comes out clean. Remove from oven and allow to cool to room temperature. Prep the cupcakes for filling by using a knife or cupcake corer to make a well in the middle of the cupcake. For the filling, mix the cream cheese and powdered sugar together. Stir in the vanilla and whipped topping. Mix until fully smooth. Using a piping bag, fill each cupcake with the cheesecake mixture. Cover each hole with a small piece of the leftover cupcake cores. For the frosting, beat the butter and powdered sugar in a mixer until smooth. Stir in the vanilla and cinnamon. Beat in the heavy cream until the frosting reaches the desired consistency. Pipe onto cupcakes. Decorate with sprinkles if an extra special dash of cheeriness is requested. These cupcakes should be refrigerated when not serving. 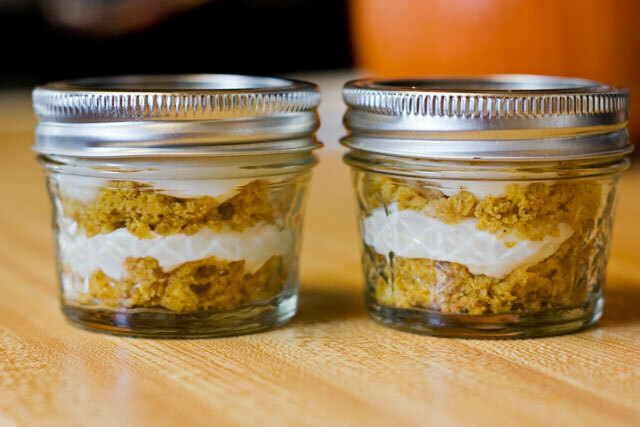 Bonus: Layer any leftover cupcake cores & cheesecake filling for a mini pumpkin cheesecake trifle. Are you on Facebook? 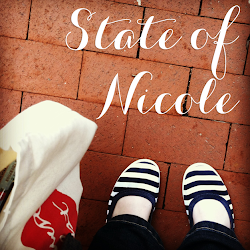 Head on over to the new State of Nicole Facebook page!